As I mentioned before, Nichols is a predictable writer. Her style remains virtually the same in every book that she writes. However, it is her method of story-telling that draws me in time and time again. I love that she weaves the history of her characters into her works. You get to know them in the present tense and she always slowly unfolds their past to give you a better perspective on their individual life situations. Not a Sparrow Falls is no different than the rest. It is predictably engaging, enthralling and a joy to read. I snapped this book shut with a happy sigh. In this new story by Nichols, we meet Mary Bridget Washburn who is on the run from a rather sordid past that she created for herself. The main themes in this book are: broken families, drugs, and the Presbyterian church. (The drugs and the church do not relate to one another, should you be wondering!) Although the first two themes mentioned could be dreadfully depressing, Nichols does not make them so. She makes them very real and easy to identify with, but hope is weaved through every life and every chapter and you find yourself rooting for the characters you come to love and care about. "You cannot out sin the cross." Amen to that! There is a truth that is worth spending a little time thinking about. Mary is in hiding and takes on a new name and identity to shield her from her past. She takes a job as a nanny in the home of a Presbyterian minister who has lost his wife and is struggling to survive in ministry and with his family of three children. You can go ahead and make some guesses as to how the story plays out and you likely wouldn't be wrong. As I said - Nichols is really predictable. BUT! How is it all going to come together? Ah! That is the question and the adventure is worth the time if you'll consider going on this little journey. I do not know what ride Nichols intends to take her readers on next, but I intend to follow along after her, devouring whatever her pen puts down on paper. 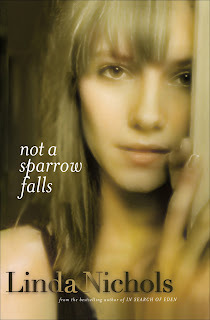 I'm thoroughly entertained, charmed and strangely comforted by her works and Not a Sparrow Falls is no exception to that. If you haven't given Nichols a chance yet - now is just as good a time as any! This is in my stack to read! I listened to Searching for Eden...and loved it. Thanks for recommending her! I've never heard of this author and, like you, don't tend to love a lot of Christian fiction. I trust your review though so I just put this on hold at my library. I'm intrigued and can't wait to get it. Thanks for reviewing it. I read this book several years ago and really, really liked it! I'm glad I read your review. This is a book I've looked at but wasn't sure I'd like. It sounds good! Thanks, Carrie! I have this one in my "queue" and now I'm looking forward to reading it even more!